A gourmet five-course dinner with manners to match won Buffalo State Dining a Loyal E. Horton Dining Award. 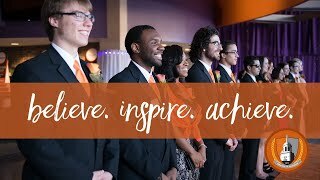 On April 24, the National Association of College and University Food Services (NACUFS) granted Chartwells at Buffalo State a bronze award for its Manners Matter Etiquette Dinner entry in the Catering Special Event category. 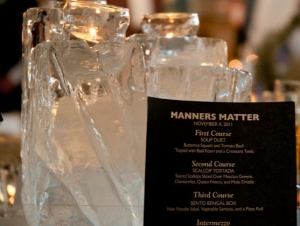 Manners Matter is an annual event developed by Buffalo State’s Career Development Center and Hospitality Department that is intended to help students gain the poise they will need in a professional setting. They worked in conjunction with Chartwells to present the event last November in Campbell Student Union's Social Hall. Open to all students, the event taught guests not only how to use utensils correctly but also how to mingle with aplomb during business meals. Chartwells developed the menu, prepared the food, and decorated the hall. Hospitality students helped serve all the dishes, including tableside strawberries Romanoff. During the event, etiquette experts provided tips on managing place settings, avoiding top dining mistakes, and making a positive first impression. "I expected us to win someplace inside the categories," said Marissa Dinello, marketing director for Chartwells. "I knew we put so much work into it. I couldn’t imagine another college doing a better job." The NACUFS Loyal E. Horton Dining Awards celebrate exemplary menus, presentations, and special event planning.